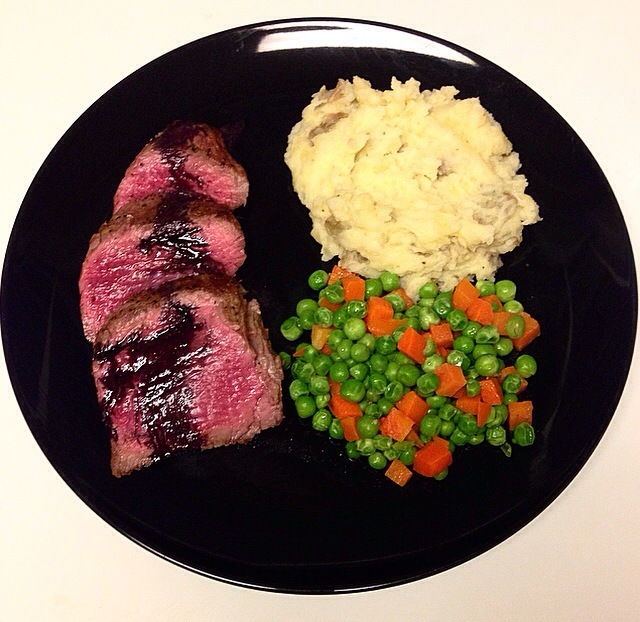 Steak ‘n’ Potatoes: Filet with a Red Wine Reduction, Truffled- Mashed Potatoes, and Veggies – Pao Says, "Open Wide!" It’s a red wine kinda night, so I figured I’d make something that paired well with it. A fancy dinner can certainly be simple and easy to make- and this meal is a prime example. I used petit filet (one is perfect to feed two people, so adjust accordingly). After patting it dry with a paper towel, I sprinkled salt, garlic powder, and pepper to coat the whole thing (I’d say about a quarter to half teaspoon of each- just make sure to lightly coat all sides of the filet). I set it aside for a few minutes while I chopped the potatoes (into half to 3/4 inch cubes so they cook faster) and prepared to boil them in salted water. Once I got the potatoes boiling, I heated up my skillet to medium-high and drizzled a touch of olive oil in the pan. Once the meat hit the pan, I cooked it for about 3 minutes on each side (and made sure to get each of the small sides for about a minute each as well). Once it was cooked, I set it aside on a foil-covered plate to rest (it keeps cooking a bit during this time) This gave me a rare+ temperature. While the meat was resting, I drained the potatoes and mashed them with some butter, a splash of milk, a couple of drops of truffle oil, and some pepper. (I don’t add salt here because, since I salted the water they cooked in, the potatoes are already seasoned). The peas and carrot mix was just a frozen mix- steamed it and then added a bit of butter and garlic salt.